For the last 11 years I have slept with a snorer. I have heard every excuse possible; weight gain, a cold coming, not enough pillows, too many pillows, too cold, too hot, too much cheese, too much beer, too tired, I was on my back, it’s a man thing etc. I’ve heard them all. . . And then there’s that sudden self-assured little voice declaring, “But I don’t snore!”….If you live with a snorer, I’m sure you have heard that one before too! Commuting in London for 8 years I experienced my fair share of snorers. It’s amazing how quickly people can sit down and suddenly be in the land of zzz’s, mouths open and that glorious, non melodic repetitive sound of snore penetrating the whole carriage. Watching those around them looking round to see who the culprit is, or just burrowing their face in to a phone and acting completely oblivious. Funnily enough, it was always men that I experienced on the train / tube, but that’s not to say I haven’t heard women snore too. So, when Breathe Right contacted me to see whether I would like to try their nasal strips I jumped at the chance. To be fair to my husband, he’s definitely not THAT bad, it is more of an occasional spell of snoring, rather than an all night every night. However, I thought, anything to have a decent nights sleep! When they arrived there were two boxes, one for me and one for my husband, as well as a couple of earplugs, how fitting! Since we moved to Cheltenham 7 months ago he has been living away 2/3 nights a week as he is still working in London. It is working well and it means that a) I have the bed to myself, no fighting for cover and b) I don’t get woken by snoring. It’s quite amazing, just like knowing seconds before my toddler cries out in the night that she’s going to, I can also tell he’s going to snore before he’s even started sometimes. My party trick, I suppose! So, I popped the box on to his pillow as a little “welcome home” gift. He was, of course more than happy to try them and I thought I would share my thoughts. I don’t regularly post about brands and I am incredibly careful to be as honest as possible. I’m not going to lie, I have been drawn in to people’s blogs before, raving about a product, only to go out and buy said product and to be horribly disappointed by it. However, saying that, one man’s junk is another man’s treasure, so what works for me, might not work for you. The strips are really simple to use and come in packs of ten. They are easy to add in to your bedtime routine as you pop them on after your face wash and dry. They have a great stick that means they stay on all night. They don’t hurt to peel off in the morning, they don’t leave any sticky residue or a red nose either. I have also been wearing them and have found that my overall sleep has been better, it certainly feels easier to breathe with them, as they open up your nostrils. I wore them for five nights in a row and of those five nights I had four undisturbed, full nights sleep – which is very rare. I usually wake at least 3-4 times a night no matter what; usually to check my blood sugar, or if Florence stirs, or if my husband is snoring, or…just because! Miraculously my husband has not had one snoring episode since he’s been wearing them, despite having quite bad hay fever and a little cold. Not even the heavy breathing- which I know can be frustrating for some people too. He has slept much more soundly and has even admitted that he feels better for wearing them. Would I recommend them? Yes I would. I mean, if you live with someone who snores, anything is worth a try, right?! I will buy some more as, for now, they are working for my husband. If it means I get a better nights sleep, and that he does too (less waking up with an elbow in to your ribs!) then I’ll do it. I don’t feel like I need them (sound like my husband!! ), but they are comfortable to wear. I think, if I were to become a little run down or feel a cold coming on I would definitely purchase some. I have already recommended them to my Mother, who has slept with a snorer for the past 42+ years. It is said that snoring is often the result of overindulgence in some of life’s pleasures. The following are the causes of snoring and by controlling them, you can become quiet at night. Where can I buy Breathe Right? For any further questions about Breathe Right, please contact our customer relations team – customer.relations@gsk.com/ 0800 7838881 (UK). 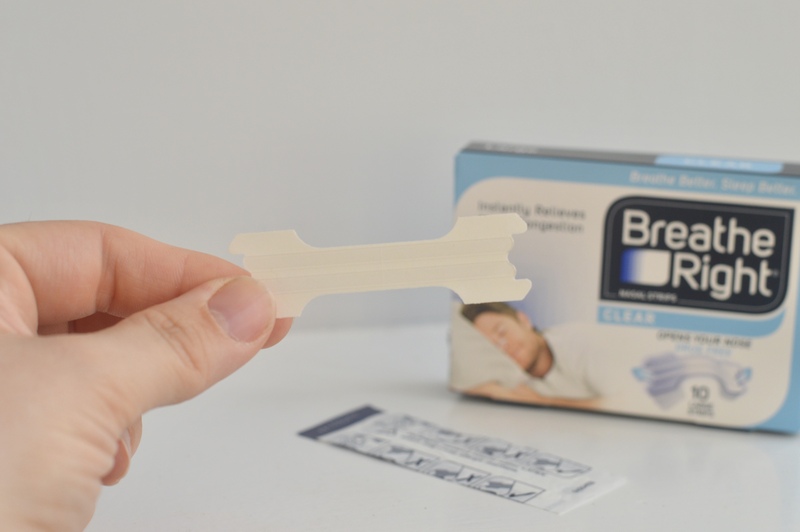 ** Breathe Right sent me the nasal strips hamper as a gift in celebration of National Snoring Week. I have been as open and honest in this blog post as I can be about the product. All photos are my own and owned by Emma Porter Limited. Excellent post and beautiful photography, as usual. My husband (of 40 yrs) is a terrible snorer, so much so I have made him go to the Dr a few times. They told him to lose weight, he didn’t. I am heading out to the shops later to buy a box of these, as you say, anything is worth a try for a decent night sleep! Thanks again!